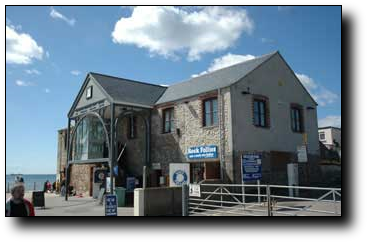 The Heritage Centre, by Charmouth beach, contains actual fossils found in the area along with interactive displays. They also have an audio video show covering how fossils were formed and the best places to find them in the local area. The Centre also has disabled access facilities There are also organised fossil hunts throughout the season. Below the Heritage Centre, you will find a Cafe which sells meals, snacks and locally produced ice cream. The adjacent Fossil shop displays a large selection of fossils, some of which are for sale. There is also a clothes shop selling new and "nearly new" clothes and sundries throughout the season. 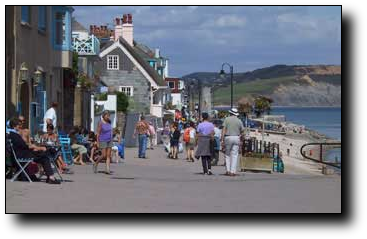 The seaside town of Lyme Regis, about 3 miles West of Charmouth, is where you will find the famous Cob as featured in the film "The French Lieutenant's Woman". There is an aquarium on the Cob which features local species of sea life. You will find all the usual attractions along the promenade. 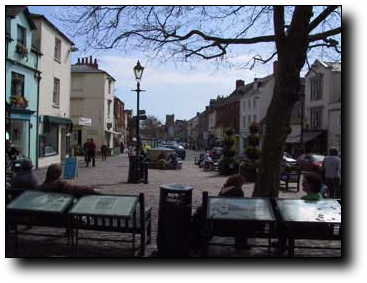 There are also museums and fossil shops in the town along with other places of interest. There are also various cafes and restaurants ranging form your local fish and chips to Italian or Indian and more. 7 miles to the East of Charmouth is the traditional town of Bridport which holds an outdoor market every Wednesday and Saturday. There is a range of shops, supermarkets, a museum and various restaurants. The local brewers, Palmers, are based in Bridport. They have daily organised tours of the brewery, where you can see the process of how they produce their beers and then sample them at the end of the tour (with home made ginger ale for the kids). After the tour you can visit their shop which stocks a full range of their products brewed on the premises. 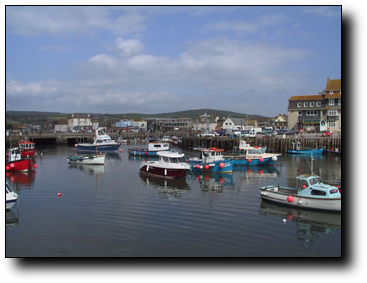 The seaside fishing village of West Bay, which was the location of the television Series Harbour Lights starring Nick Berry, is about one mile south of Bridport. You can watch the fishing boats coming in and out of the picturesque harbour or dip your toes into the sea from the shingle beach. You can sample the delights of freshly caught fish in the many Fish and Chip kiosks along the harbour side, or you can enjoy a locally produced ice cream and watch the world go by. This shows how close Seadown Holiday Park is to the Charmouth Beach. You can see the famous Cob in Lyme Regis in the background of the picture on the left hand side. When the tide is out, you can actually walk along the beach to Lyme Regis.